i need you to collect information on schools located in Sydney, Melbourne, Adelaide, Brisbane, Perth and Canberra. All schools must be high schools ( year 7 to 12 students) and must be within a 20km radius of the CBD and also be a private school. i need about 200 schools per city. I can do the work properly. because I am a high school teacher in Bangladesh. So please contact with me. I can do the job for you before the end of the week. Please do contact me. 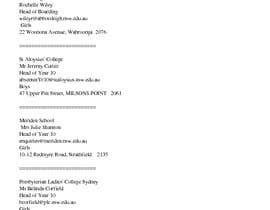 For example on Sydney there are 505 private schools, 162 of them are secondary and 80 of them are Sydney Central which would be approx. a 20km radious. if you were wanting approx.. 200 per capital city, would you still require the 162 Secondary private schools or just the ones within the city central? I can have this completed for you this week. Hi, Please contact me right now so we can start.